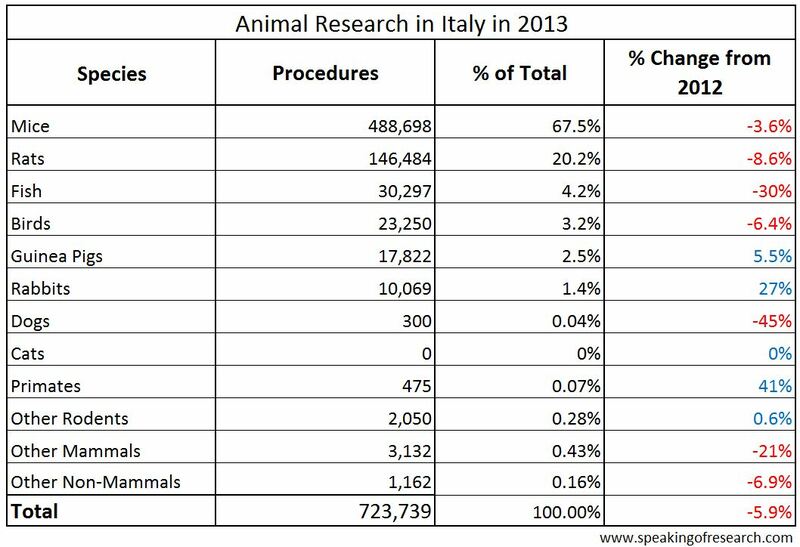 While we will be posting Austria’s 2015 statistics on Monday, Italian authorities seem a little bit behind the times having only recently published their 2013 statistics for the use of animals in research. Italy carried out 723,739 procedures on animals in 2013, 5.9% less than in 2012. The fall in the number of experiments is mainly due to a large (30%) fall in the number of fish, and a moderate drop in rats (9%) and mice (3.5%). There was also a small fall in dogs (down 45% to 300 procedures) and a rise in the number of primates experiments (up 41% to 475). 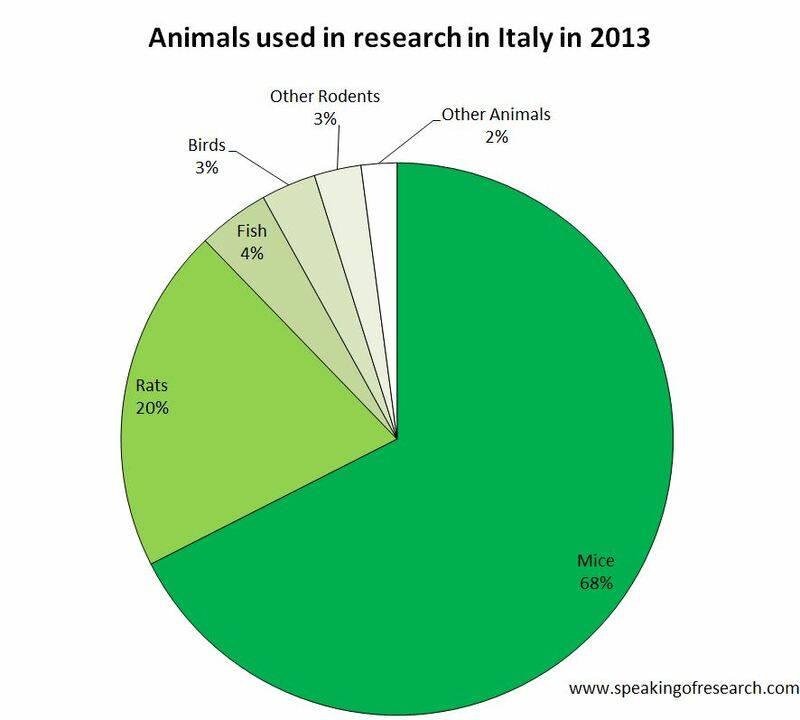 Rodents accounted for over 90% of all animals used in Italy in 2013 (mainly mice at 67.5% of the total). This rises to almost 98% when you include fish and birds. Primates and dogs together accounted for 0.1% of all research animals. No cats were used in 2013 (0r 2012). 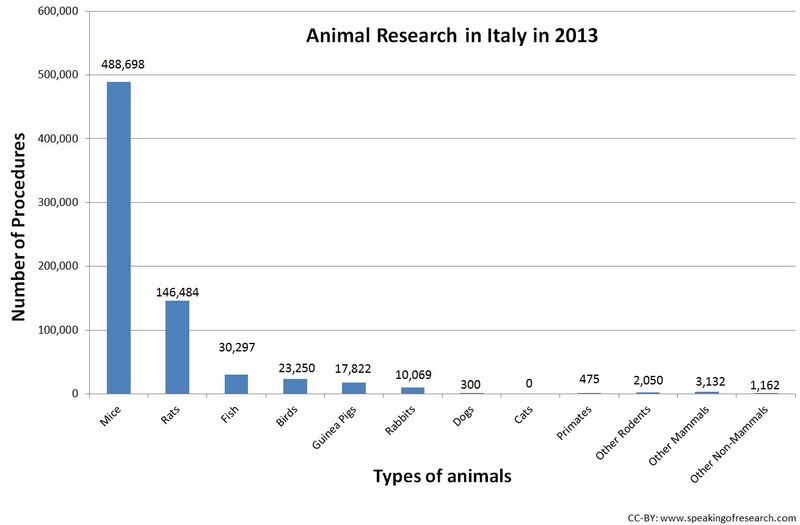 Italy’s 2013 statistics do not include measures of animal suffering – though this should come into the 2014 statistics (which most European countries have already published). What we can see (Table 2) is that most of the animal use (54%) was basic research, followed by applied human studies (17%) and safety testing of human medicine and dentistry products (14%). From historical statistics we can see a steady decline of over 25% since 2007. These numbers tend to reflect changing science funding environments within the country. 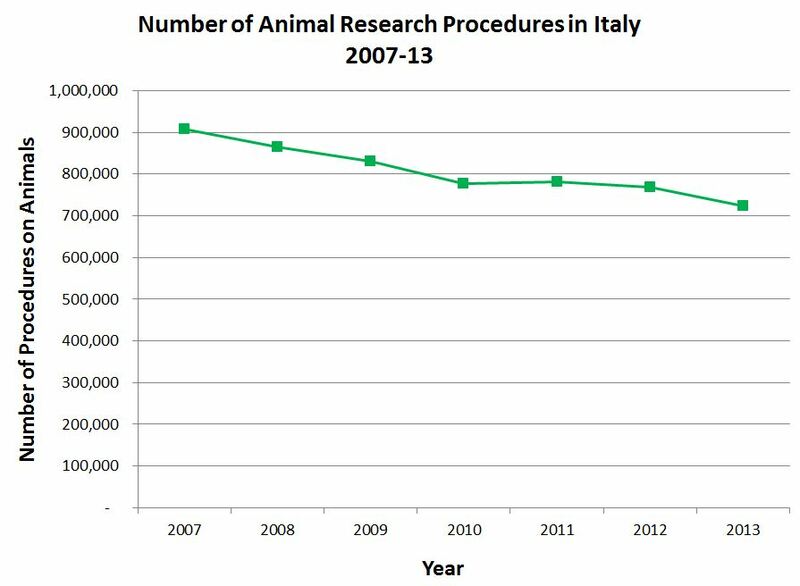 Trends in Italian animal experiments 2007-13. Click to Enlarge. On Monday we should be publishing our 2015 Austrian statistics, and we will publish other country data as we get it. See our summary of statistics to compare countries, and please send us any data you find that we are lacking. Posted on July 1, 2016 July 13, 2016 by EditorPosted in News, StatisticsTagged annual statistics, Italian, Italy, Statistics.